Available on Amazon & Kindle Unlimited. Also available in paperback. Fairytale endings and happily ever after's… The series that challenged it all. Shelby has finally put her mysterious past behind her until a handsome stranger knocks on her door bringing news that will change both of their lives forever. 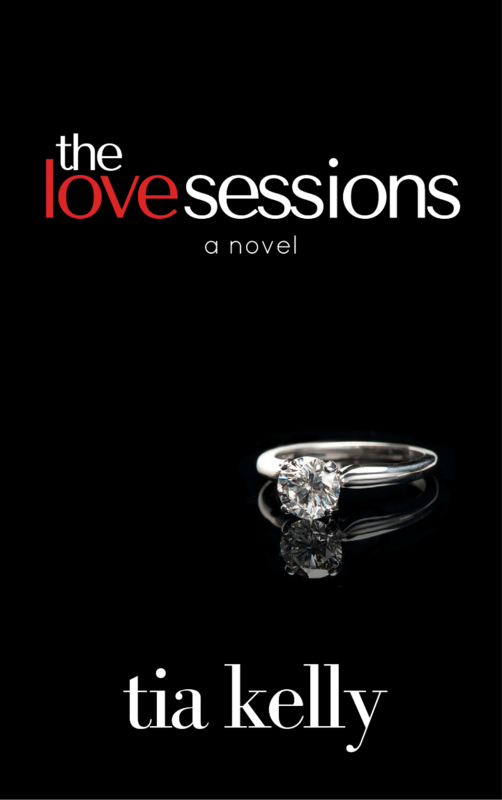 Love’s Rebound is a novella prequel for The Love Sessions novel. Click here to read a free copy of Love's Rebound. Alexis just wanted to go home. When her ride canceled at the last minute it was her roommate’s boyfriend, Terrence, who happened to come to the rescue. Along the way a blizzard draws Alexis and Terrence together, but it would be a damaging secret that ultimately keeps them apart... until now. Save Me From You is a novella prequel for The Love Sessions novel. When Mya and Donovan decided to bring the new year in with a bang, neither of them expected their friendship to fizzle away the morning after. Now Mya is ready to move on, but there is one obstacle standing in her way… Donovan. A man that is determined to prove to her that friends can be lovers, too. Give Me You is a novella prequel for The Love Sessions novel. Click here to read a free copy of Give Me You. Keri knows words have power. That’s why she believes the man who put the engagement ring on her finger loves her enough to spend his entire life with her. It takes a trip to a premarital retreat and a chance encounter with a handsome stranger that opens her eyes to the true power of commitment and what it really means to exchange vows. Fairytale endings and happily ever after’s… the series that challenged it all. Available on Amazon, iTunes, Kobo, Barnes & Noble and Google. For Donovan, Mya, Shelby, Veronica and Darius, their guesses are as good as anyone else’s. Relationships appear intact, but behind closed doors something is definitely amiss, challenging the fibers that hold these six friends together. Legacy. Every family has a story to tell. Tia Kelly invites you to come meet the Wilkersons and get ready to fall in love. Kenneth Wilkerson, baseball’s MVP of breaking hearts isn’t in town looking for complications. Focused on saving his career, he can’t afford any distractions. Paige Scott, a former party girl, has a murky past and even murkier relationship with Kenneth’s teammate and their mutual best friend, Carlos. Carlos Ortiz watched Paige go from it girl to broken. When she finally healed, Carlos made it clear he would never step aside to let another man in to hurt her again. But Kenneth feels something for her that’s not easy to dismiss and there’s one thing a Wilkerson won’t do is let anything stand between them and what they love. For Kenneth, it’s the love for the game, his family… and her. For Kenneth, there are only two diamonds that matter – the one on the field and the one on Paige’s finger. He proposed expecting all the pieces from their love story to fall into place. Instead, it pushed the couple apart. As this player prepares to retire, he’s about to face the most important and challenging season of his career – the engagement season. Kenneth realizes he has to do more than just give her his ring… he must find a way to give her his heart. On paper, they’re perfect for each other. In pictures, they look great together. And the chemistry? Off. The. Charts. Except one tiny detail is keeping them apart – Rochelle and Carlos despise each other and the emotions they stir up together never tasted so good. When his wife died, Jeremy Wilkerson resigned himself to living a passion-free life. Throwing himself into his career and raising his daughter, he’s convinced casual affairs are all he needs. Allie is driven. She doesn’t see family or even a long-term relationship in her near future, and fortunately, her colleague Jeremy feels the same way. Their no-strings-attached arrangement suits both of them just fine. As Jeremy and Allie reach an understanding that what happens between them in private remains that way, the unexpected threatens to tear down the walls between bedroom and boardroom. And when the dust settles, Jeremy and Allie will have their ideas tested about the meaning of commitment, family and the kind of love that lasts a lifetime. Every player lives by their own set of rules. The son of an NBA legend, Trent Scott was born a catch and groomed from birth to know it. Little fazes him, including the mystery woman that appears on his doorstep with a baby in tow… even when she claims he’s the father before disappearing. Until he can prove otherwise and find the delusional woman, he’s stuck caring for a kid he knows can’t be his… or is it? Brandi is ready to start the next chapter of her life. After coming to the rescue of a frazzled (and extremely attractive) stranger with an adorable (yet obviously upset) baby, she can’t help but fall for Trent… which wouldn’t be so bad if she was convinced Mr. Bachelor for Life felt the same about her. Available on Amazon, iTunes, Kobo and Barnes & Noble. Also available in paperback. Meet Warren (junior that is). Just like his late father and namesake, he’s a player… except not one to get caught up in drama like his dad. There will be no out-of-wedlock babies (or in-wedlock either), no trail of tears in his honor, and damn sure no love. His path is his own and he doesn’t have time for distractions – just temporary detours. Meet Brooke. It doesn’t take long for Warren to realize she’s perfect – as a player recognizes their own. She gets the rules and expects no exceptions. In fact, she even has a few rules of her own. But what fun are rules unless they can be broken? Available on Amazon. Also available in paperback. Diane Collins has big plans for her life, and hoops star Warren Scott is not among them. He doesn’t want to be the face of the NBA, and she doesn’t care that he is. His reluctance to be part of the limelight disarms her and the two embark on an unlikely friendship that becomes an even unlikelier romance. Soon, his life is her life – filled with VIP treatment, parties, and luxuries beyond Diane’s wildest imagination. But Warren is harboring a secret, and once it’s revealed, Diane’s decision to stay or go could change the very fabric of who she thought she was. Available on Amazon, iTunes, Kobo, Barnes & Noble and Google. Also available in paperback. Dominique always hoped her best friend Taj would have been a part of her happily ever after before discovering his girlfriend was expecting his first child. Dominique moved on – until she catches his now-ex dishing the dirt on Pro Wives, a reality show that made his ex a celeb in her own right, and at the basketball player’s expense. Although Taj hurt her years ago, Dominique believes there’s more to the story his ex is painting. She decides to investigate the matter, but the sparks that ensue while cameras are rolling end up being a little too hot to leave on the cutting room floor. Teresa lives by the rules to keep her world from spinning out of control until a charming stranger tempts her to let more than her inhibitions go. Available on Amazon, Kobo and Barnes & Noble. In her novella The Affair, Tia Kelly takes the reader where married men aren’t supposed to go… into another woman’s bed.